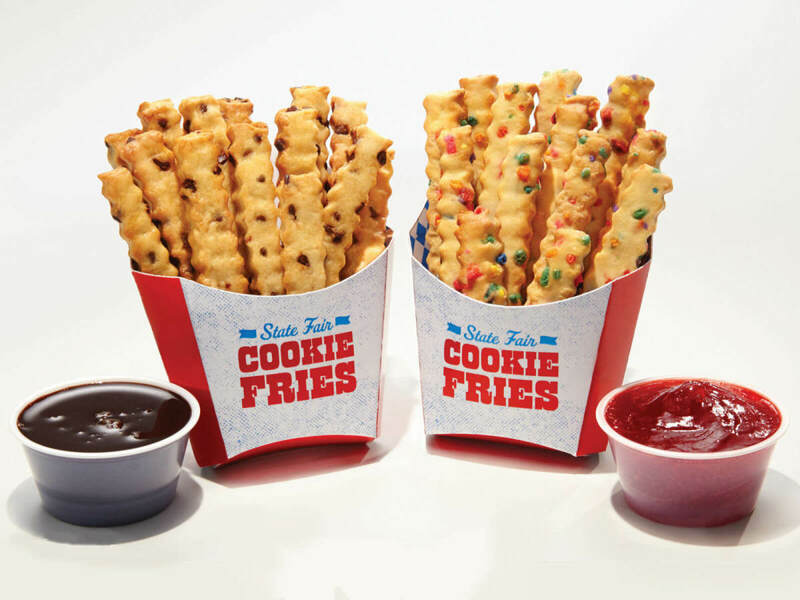 The State Fair of Texas has revealed the eight finalists for its 2016 Big Tex Choice Awards, more commonly known as the fried food awards. High-five to fried Jell-O! You made it. 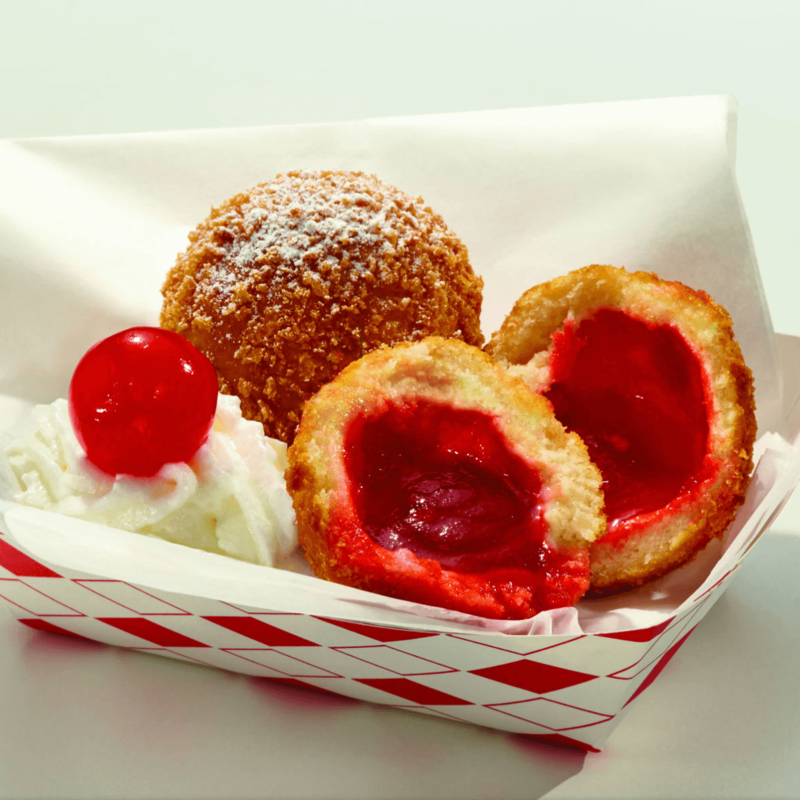 Fried Jell-O is probably the most outrageous among the finalists, but it has plenty of competition. The list also includes hot pockets, food on a stick, and something called injectable balls. 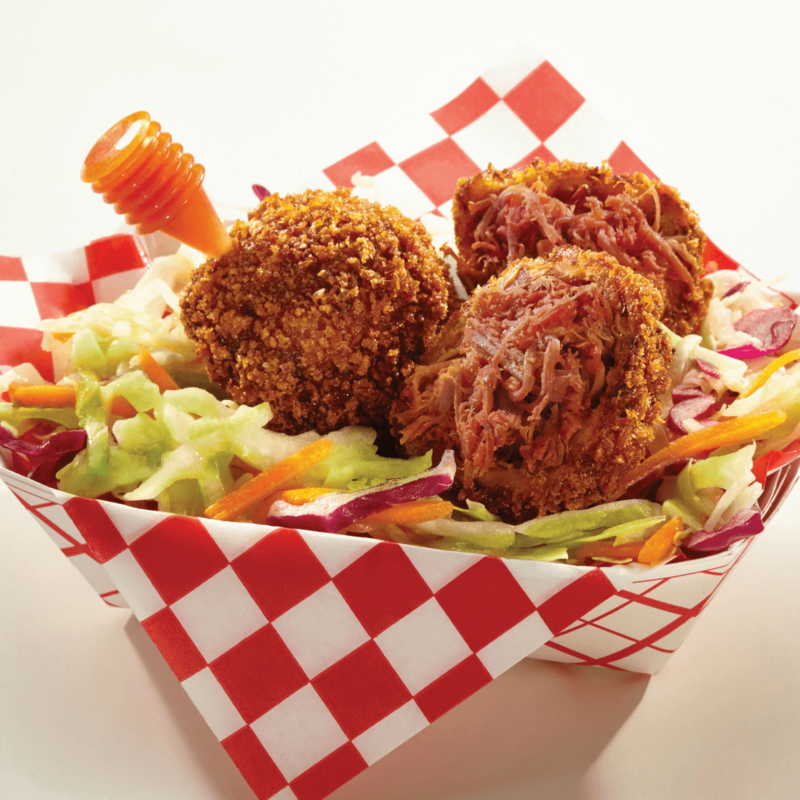 Each year, State Fair concessionaires devise boundary-busting foods for a chance to compete for the winning titles of Best Taste and Most Creative. 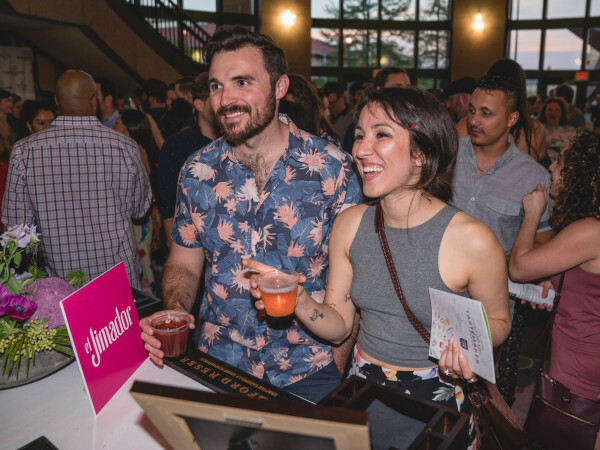 This year’s winners will be announced with much hoopla on August 28. 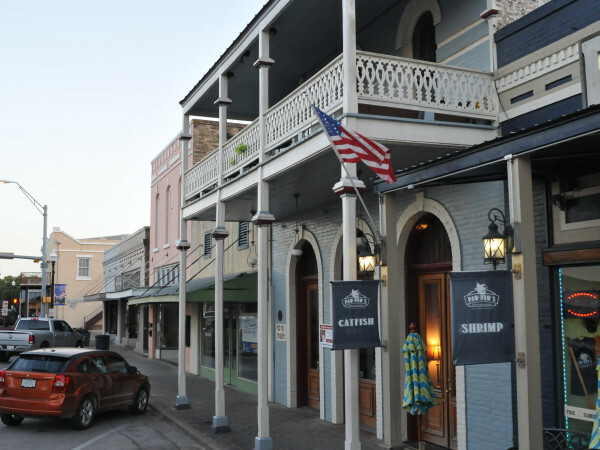 These eight finalists were culled from a larger list, released in July, that included lots of things on sticks and loads of bacon: bacon-wrapped churros, bacon-wrapped pork belly on a stick, bacon-wrapped tater dog, bacon burger dogs on a stick, a "Bacontilla," and Dorito bacon fried cheese stick. Only the bacon burger dog slider on a stick emerged from the bacon field. Pineapple was a popular ingredient, as well, with three entries: Caribbean pineapple "Korn-a-Copia," fried "Pinatacolupa," deep fried Hawaiian hoops, and an entry called "Pina-A lot-Ta." One pineapple made it through. 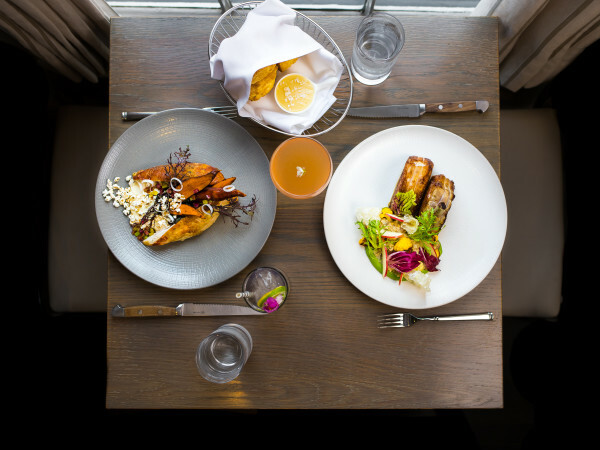 Marinated grilled chicken and shrimp are served over a bed of yellow Caribbean fried rice and topped with a tropical salsa and pineapple rum glaze. Served in a pineapple half shell. A miniature ground beef patty is stuffed with shredded cheddar cheese, bacon, and a hot dog on a Hawaiian roll, then placed on a skewer topped with a pickle, dipped in a tempura batter, and deep fried. Served on a bed of shoestring fries with ranch dipping sauce. A Funyun is stuffed with pulled pork, pepper Jack cheese, pineapple slices, and bacon, then dipped in a batter and deep fried. Served with sweet barbecue sauce. Shredded chicken, potatoes, carrots, peas, and corn in a white sauce is ladled into pastry dough, then folded Hot Pocket-style, and fried. Served with a side of mac-and-cheese-inspired dip. 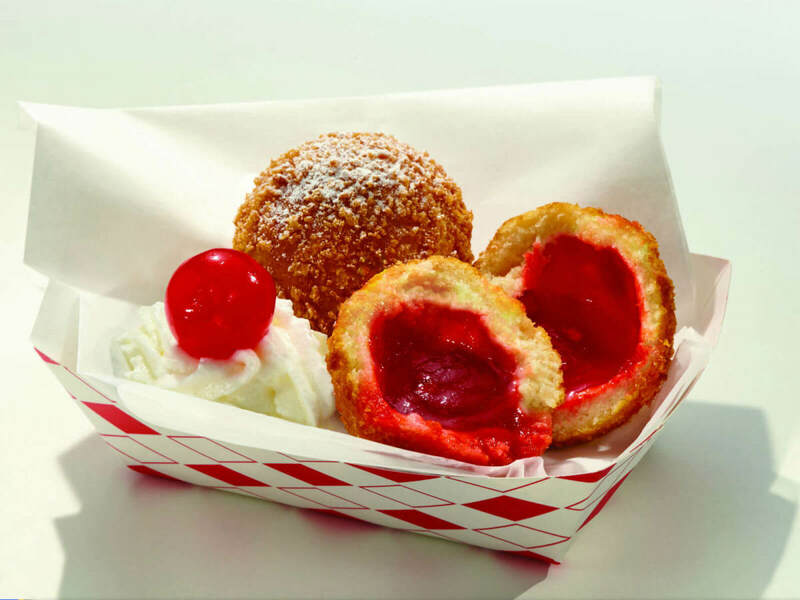 Cherry Jell-O in a panko-crusted breading, flash-fried, and dusted with powdered sugar. Served with whipped cream and a cherry. 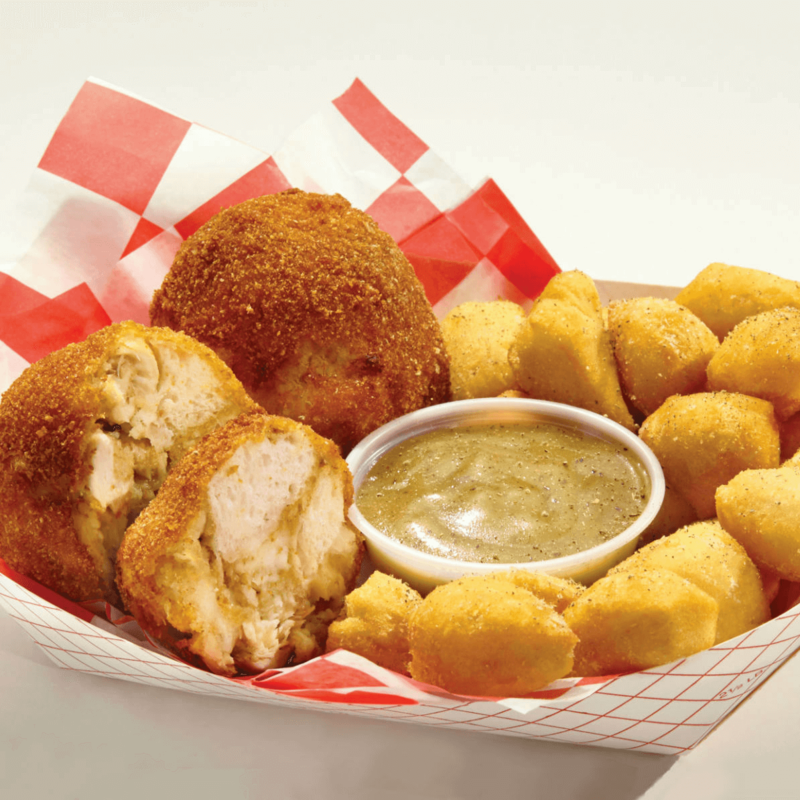 Beef brisket and bock barbecue sauce is molded into balls, rolled in seasoned breadcrumbs and fried. 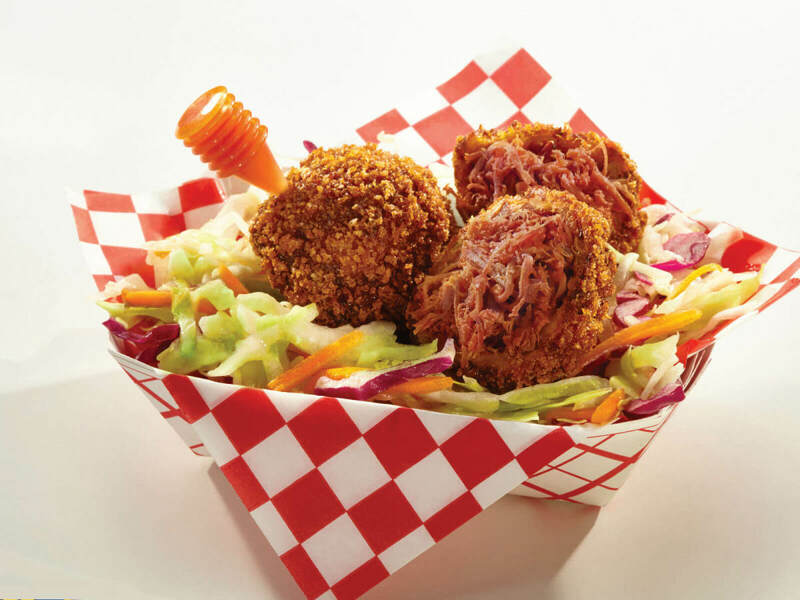 Served on a bed of coleslaw, each order comes with its own pipette of bock barbecue sauce to be injected into the brisket balls. 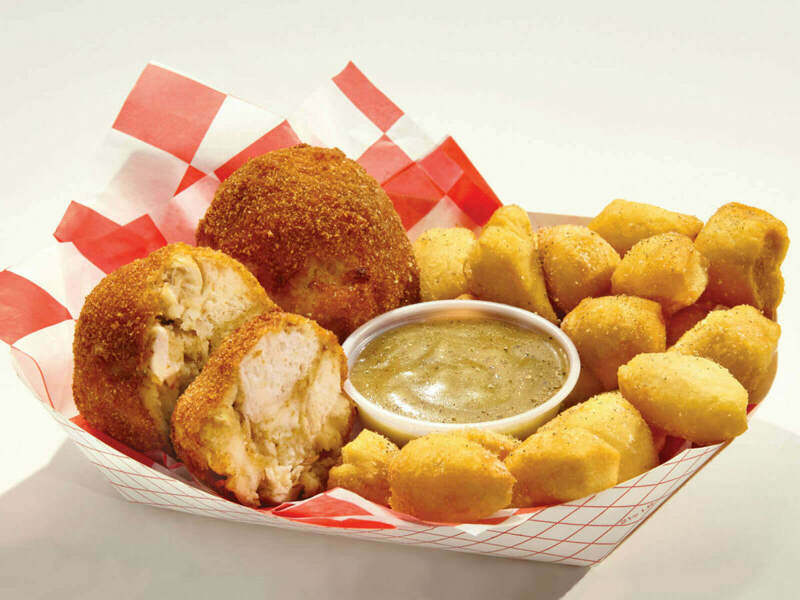 Shredded chicken is mixed with seasoning, dough, and gravy; rolled into balls; coated with breadcrumbs; and deep fried. Served with fried biscuit bites and a side of gravy. 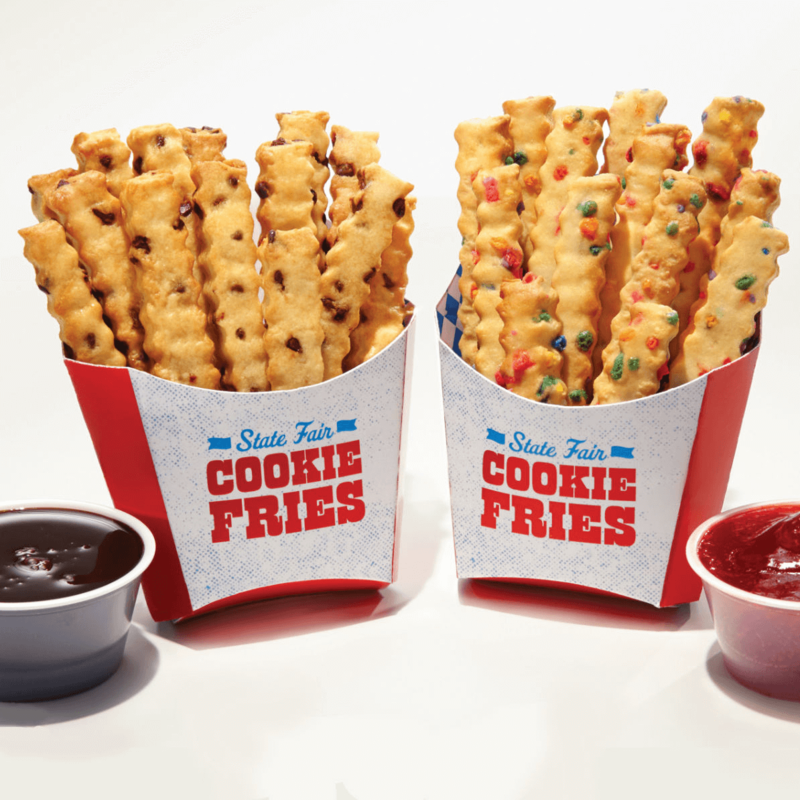 Looks like a classic crinkle-cut fry but offered in traditional cookie flavors like chocolate chip or sprinkles. Served with choice of strawberry or milk chocolate sauce.